To investigate the characteristics and changes in microdistortions in Bowman's layer 3 years after small incision lenticule extraction (SMILE). In this non-randomized, prospective study, 50 eyes of 28 patients who received SMILE with a mean spherical equivalent of −6.72 ± 1.41 diopters (D) were divided into a thin lenticule group (lenticule thickness ⩽ 135 µm) and a thick lenticule group (lenticule thickness > 135 µm). Examinations were performed preoperatively and 1 day, 1 month, and 3 years after SMILE. Microdistortions in Bowman's layer determined via optical coherence tomography were analyzed digitally. All patients completed the follow-up with no complications. Three years after SMILE, no eyes exhibited loss of corrected distance visual acuity. The safety index was 1.20 ± 0.15 and the efficacy index was 1.01 ± 0.10. The respective mean lengths of microdistortions at 1 day, 1 month, and 3 years after SMILE were 2,397.47 ± 1,777.22, 3,444.87 ± 2,145.82, and 1,283.81 ± 1,184.43 μm. The respective mean microdistortion lengths at each time-point were 1,781.29 ± 17,78.15, 2,617.78 ± 1,949.67, and 1,112.95 ± 1,245.88 μm in the thin lenticule group and 2,692.10 ± 1,825.20, 3,739.20 ± 2,072.60, and 1,332.44 ± 1,137.33 μm in the thick lenticule group. Microdistortions in Bowman's layer can remain 3 years after SMILE, but their lengths decrease over time. Thicker lenticules were associated with the early occurrence of microdistortions, but this effect decreased in the long term. As one of the prospective refractive surgeries, small incision lenticule extraction (SMILE) has proven safe and effective for correcting myopia and astigmatism,1–4 with fewer changes in corneal biomechanical parameters than LASIK.5–7 It can also deliver faster repair of corneal nerves and central corneal sensitivity than traditional laser in situ keratomileusis (LASIK) procedures with flaps.8,9 In previous early clinical investigations, we found that microdistortions in Bowman's layer could be detected via Fourier-domain optical coherence tomography (FD-OCT) on the first day after SMILE and remained stable for at least 1 month.10,11 It is necessary to study changes in these microdistortions in the long term. Notably, a relatively crude microdistortion quantification method was used in our previous study10,11 and it did not involve precise quantitative analyses of the lengths of the microdistortions. Therefore, based on our previous studies, in the current study digital analysis software was applied to refine the investigation of microdistortions and to calculate their lengths in an effort to gain insight into the long-term features and changes in microdistortions 3 years after SMILE. In this nonrandomized, prospective study, 50 eyes of 28 consecutive patients (11 men and 17 women) who received SMILE were recruited, with a mean age of 30.14 ± 7.77 years (range: 19 to 45 years) and a mean spherical equivalent (SE) of −6.72 ± 1.41 diopters (D) (range: −3.50 to −9.25 D). The preoperative corrected distance visual acuity (CDVA) was 20/20 or better in all eyes, and no patients had any ocular conditions other than myopia with or without astigmatism. Routine preoperative examinations were performed to exclude the presence of surgical contraindications. Informed consent was obtained from each patient after the nature and possible consequences of the study were explained to them. The research was conducted in accordance with the tenets of the Declaration of Helsinki, and ethics approval was obtained from the institutional review board of the Eye and ENT Hospital of Fudan University. All operations were performed by the same surgeon (XZ), who was experienced with SMILE procedures. Target refraction in all eyes was plano. SMILE was performed using the VisuMax femtosecond laser system (Carl Zeiss Meditec AG, Jena, Germany) with a repetition rate of 500 kHz, pulse energy of 130 nJ, intended cap thickness of 100 µm, cap diameter of 7.5 mm, lenticule diameter of 6.3 to 6.5 mm, and a side cut with a circumferential length of 2 mm at the superior 12-o'clock position. The eyes were divided into two groups according to the intended lenticule thickness: 135 µm or less (24 eyes; thin lenticule group) and greater than 135 µm (26 eyes; thick lenticule group). Routine postoperative care was conducted after the surgery with tobramycin eye drops, 0.1% fluorometholone eye drops, and artificial tears. The morphological features of Bowman's layer were observed via anterior segment Fourier-domain optical coherence tomography (FD-OCT) (RTVue, software version 6.2; Optovue, Inc., Fremont, CA). The cornea was imaged with an 8-mm long line scan pattern along the 0°, 45°, 90°, and 135° meridians. Sixteen consecutive frames were acquired with the line scan mode for each scan. Bowman's layer can be detected as a smooth double-line structure beneath the surface of the cornea on OCT images. The twisted segments of Bowman's layer were defined as microdistortions, in accordance with our previous studies.10,11 Peak was defined as the convex component of each microdistortion above the baseline level of Bowman's layer, and trough was defined as the bottom component of the microdistortion beneath Bowman's layer. The number of microdistortions for each meridian was summed as the total number of all peaks in the four line scans, and the central 1-mm zone was defined as the central area. Each OCT image was digitalized via AutoCAD software (version I.18.0.0; San Rafael, CA) and the analysis software Adobe Illustrator (version 6.2; San Jose, CA). AutoCAD was used to calculate the pixel length of the microdistortions in terms of dots per inch (DPI). The anterior and posterior corneal boundaries were acquired automatically and the corneal thickness was displayed by the software. Through multiple measurement on the OCT image, we converted the pixel length (DPI) into microdistortion length (µm): 1 DPI = 6.9 µm (Figure 1). The total length of all corneal Bowman's layer microdistortions in the four meridians of each eye were summed to obtain quantitative results for statistical analysis. All imaging was performed by the same examiner (JZ) and analyzed by another subject-blind investigator (YG). The analyzer was also blind with regard to group and time information pertaining to the OCT images. Follow-up observations of the microdistortions in Bowman's layer of the cornea were conducted 1 day, 1 month, and 3 years postoperatively. (A) Through multiple measurement on the optical coherence tomography (OCT) image, the pixel length (DPI) was converted into microdistorion length (μm). (B) An illustration of the measurement of microdistortion lengths in the horizontal meridian. The independent samples t test was used to compare the groups. Repeated measures analysis of variance was conducted to evaluate changes in microdistortions at different time points. A P value of less than .05 was defined as statistically significant. All data were collated using Excel software (version 2003; Microsoft Corporation, Redmond, WA). Statistical analyses were performed with SPSS software (SPSS, Inc., Chicago, IL). The preoperative parameters of both groups are shown in Table 1. There were no significant differences in preoperative parameters between the two groups except that refractive sphere, spherical equivalent, and lenticule thickness were higher in the thick lenticule group (P < .05). All surgeries were performed uneventfully. On the first day after surgery, 83.5% (20 of 24) of eyes in the thin lenticule group and 73.1% (19 of 26) of eyes in the thick lenticule group exhibited uncorrected distance visual acuity (UDVA) of 20/20 or better. At 1 month postoperatively, the respective values were 95.8% (23 of 24) and 92.3% (24 of 26). No eyes exhibited a loss of CDVA at 3 years postoperatively, and 100% of the eyes were within ±0.75 D of the target refraction. The safety index was 1.20 ± 0.15, and the efficacy index was 1.01 ± 0.10. There were no statistically significant differences in SE between the two groups at either time point (P > .05). The refractive and visual outcomes of both groups are shown in Table 2. On both 1 day and 1 month after surgery, microdistortions in Bowman's layer were observed in 70.8% (17 of 24) of eyes in the thin lenticule group and 80.8% (21 of 26) of eyes in the thick lenticule group with FD-OCT, but these microdistortions cannot be detected using slit-lamp microscopy. On the first day, the average number of microdistortions was 4.1 ± 2.8 (range: 0 to 10) in the thick lenticule group, which was significantly greater than 2.4 ± 2.0 (range: 0 to 5) in the thin lenticule group (P < .05). At 1 month postoperatively, the average number of microdistortions was still greater in the thick lenticule group (2.8 ± 2.1) than in the thin lenticule group (1.4 ± 1.1) (P < .05). At 3 years postoperatively, microdistortions still existed in 45.8% (11 of 24) of eyes in the thin lenticule group and 65.4% (17 of 26) of eyes in the thick lenticule group. The average number of microdistortions was significantly greater in the thick lenticule group than in the thin lenticule group (2.3 ± 1.8 vs 0.9 ± 0.7, P < .05). The interface between the cap and stroma was smooth and uniform in all eyes, with a blurred density signal reflection line on OCT imaging. Repeatedly measured analysis of variance showed fewer microdistortions over time in both groups (P < .05). There was no significant difference between 1 month and 3 years postoperatively in each group. The average number of microdistortions in the central 1-mm area was 2.5 ± 2.1 on the first day, 1.7 ± 1.4 at 1 month, and 1.1 ± 0.9 at 3 years after surgery in the thick lenticule group and 1.3 ± 1.2, 0.8 ± 0.6, and 0.3 ± 0.4 in the thin lenticule group at each time point. All showed a decreasing trend from the central to the peripheral area (P < .05), except no difference was detected in the thin lenticule group at 3 years postoperatively. For all eyes after SMILE, the mean lengths of Bowman's microdistortions in the detected eyes at each time point are displayed in Table 3 and Figure 2. At 1 month postoperatively, the mean lengths of the microdistortions were significantly longer than they were at 1 day and 3 years postoperatively, and the mean lengths of the microdistortions were the shortest at 3 years postoperatively (P < .05). The respective mean lengths of microdistortions in both groups are also shown in Table 3. 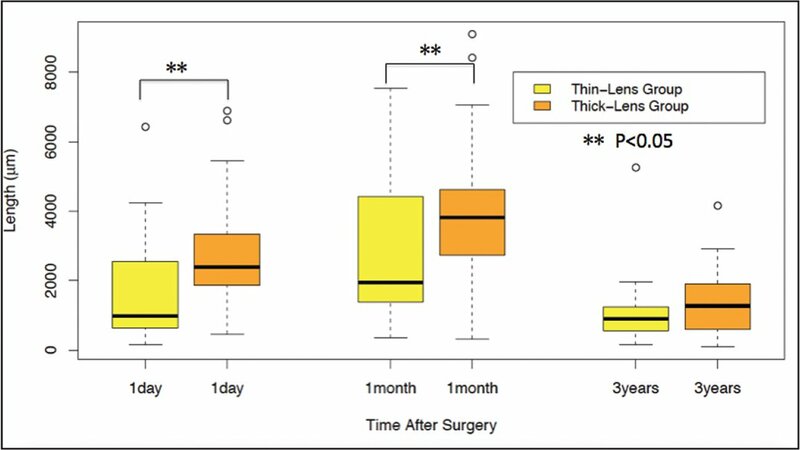 The differences between the two groups were statistically significant at 1 day and 1 month postoperatively (P < .05), but not at 3 years postoperatively (Figure 3). The lengths of microdistortions vs lenticule thickness at different time points. Changes in microdistortion lengths over time in two groups. Bowman's layer is one of the important physiological structures of the five layers of the cornea. It cannot be separated from the substrate layer or regenerate after being damaged. Additionally, corneal nerve tissues pass through Bowman's layer. Patel et al.12 reported that Bowman's layer exhibited a hyperbolic shape and that changes in this shape could have specific effects on the cornea. Changes in the physical and chemical properties of the cornea may also affect Bowman's layer.10,11 It has been reported that SMILE tends to have less of an effect on the biomechanical parameters of the cornea than other corneal refractive surgeries.5,7,13 We first reported that microdistortions in Bowman's layer were evident on FD-OCT images acquired on the first day after SMILE, and that they could not be detected via slit-lamp microscopy.10 The occurrence of microdistortions was associated with surgery experience, refractive lenticule thickness, and preoperative corneal curvature on the first day and the range of microdistortions were positively correlated with myopic correction.10,11 However, the changes and influential factors pertaining to microdistortions in the long term have not yet been elucidated. In the current study, we investigated microdistortions 3 years postoperatively. The mean lengths of the microdistortions were increased at 1 month postoperatively compared with postoperative day 1. At 3 years after surgery, the mean lengths had decreased significantly, and in some eyes microdistortions had completely disappeared. In a previous study, we focused on the morphology and thickness of the corneal cap after SMILE, and found that cap thickness was greatest from day 1 to postoperative week 1, possibly due to corneal edema, then decreased over the following month and had stabilized by 6 months postoperatively.14 We speculate that corneal swelling in the early stage can lead to difficulty distinguishing the real morphology of the microdistortions, which may have resulted in the shorter lengths observed 1 day postoperatively than at 1 month postoperatively in the current study. Another reason may relate to changes in physical properties caused by corneal biomechanical parameters shortly after surgery. The mechanism may involve microdistortions reverting back to a smooth hyperbolic shape during the progressive repair of adjacent tissue, and the normal hyperbolic segments of the intervals fusing with each other due to associated biomechanical changes, such that two or more convex peaks gradually converge into one segment, resulting in a convex line and an increase in length. This might explain why the average numbers of microdistortions decreased at postoperative 1 month but the lengths were longer than at 1 day. Luo et al.11 reported that microdistortions did not reduce in quantity even after 1 month in cases of high or moderate myopia, suggesting microdistortion is not caused by tissue edema and may last for a longer time, which is concordant with the results of the current study. In the current study, some microdistortions remained but some had disappeared or decreased in length at 3 years postoperatively. However, whether this phenomenon was caused by reconstruction due to stress between the cornea and intraocular pressure or was due to other reasons requires further study. In a previous report, Yao et al.10 demonstrated that microdistortions did not have any effect on postoperative visual outcomes and were weakly correlated with the induction of higher order aberrations. This is concordant with the results of the current study. At the 3-year follow-up time point, the patients exhibited good postoperative visual acuity, without effects on CDVA or SE associated with changes in microdistortions. Additionally, microdistortions had little influence on visual acuity or refraction, even in patients with high myopia. Bowman's layer had recovered its smooth hyperbolic structure after 3 years, as confirmed via OCT. Moreover, Miao et al.15 demonstrated that SMILE induced a temporary increase in Objective Scatter Index values and Bowman's layer microdistortions, but there was no correlation between the microdistortions and intraocular scattering in a recent study. Therefore, based on previous reports we concluded that the microdistortions in Bowman's layer barely affect the quality of vision. Further studies including contrast sensitivity and a quality of vision questionnaire are worth exploring. 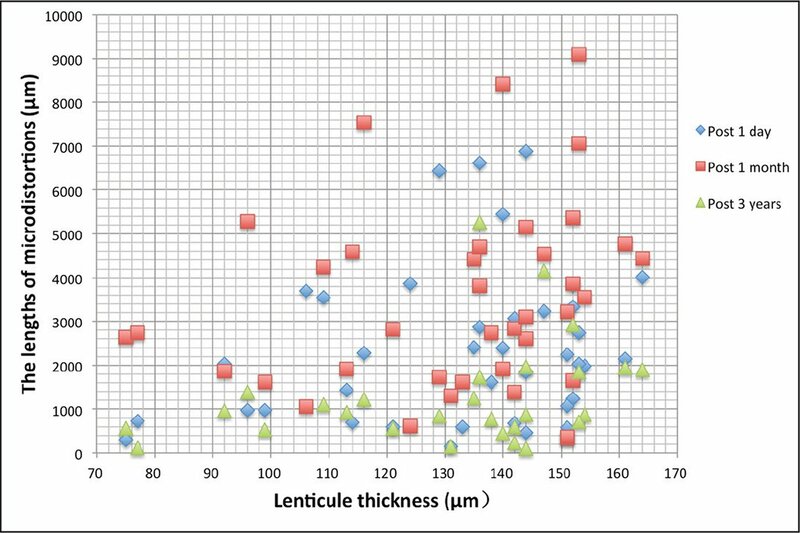 Given that both myopia and astigmatism correction may influence the extracted lenticule, we compared eyes with different lenticule thicknesses. At 1 day and 1 month postoperatively, the mean lengths of the microdistortions in the thin lenticule group were significantly shorter than those in the thick lenticule group. Luo et al.11 reported that the correction of more severe myopia with thicker lenticules introduced more microdistortions in Bowman's layer after SMILE. Based on the previous observation,10,11 we hypothesize that one of the possible causes for Bowman's layer microdistortions may be a new distribution between the cap and the interface stroma after the extraction of a refractive lenticule. According to the Charman theoretical model,16 the posterior surface area of the corneal flap after LASIK is greater than the stromal bed area. To ensure a close fit, the corneal flap should extend beyond the edge of the stromal bed. Similarly, after SMILE the alignment of the larger corneal cap with the smaller stromal bed may result in anterior segmental shrinking, and the correction of more severe myopia may be associated with more segmental shrinking. This hypothesis may be further supported by the distribution of the microdistortions. Our results showed that more microdistortions were detected in the central area than the periphery because the center had the largest change of curvature. 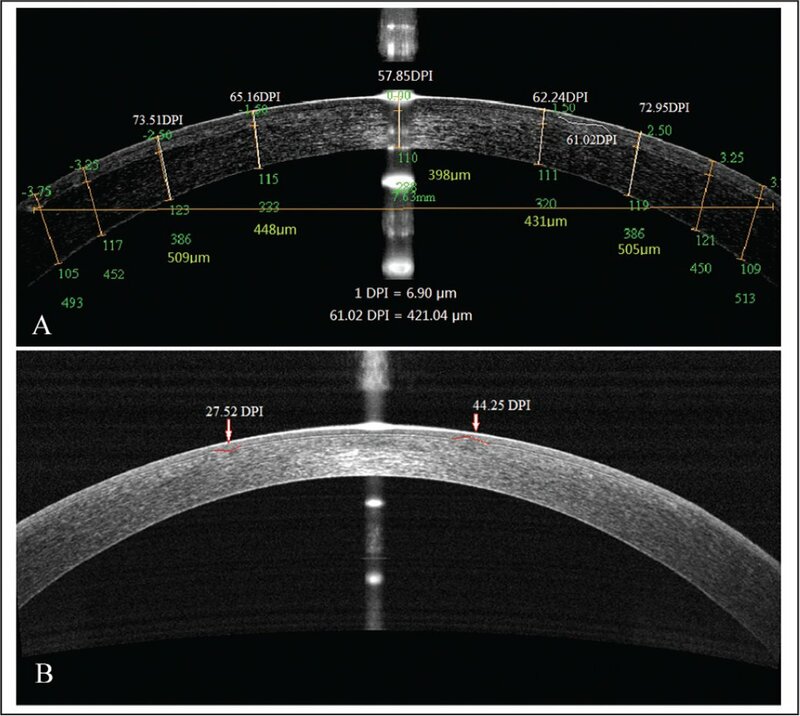 In a study involving a mean follow-up period of 11.1 ± 5.0 months (range: 4 to 14 months), Yao et al.10 reported that the total number of microdistortions was associated with refractive lenticule thickness. However, in the current study there was no statistically significant difference between the mean lengths of the microdistortions in the two groups at 3 years postoperatively, indicating that the lenticule thickness effect was decreased in the long term, and Bowman's layer had almost reacquired its original smooth hyperbolic structure. The underlying causes of these phenomena remain unclear. The observed results may have been due to changes in overall corneal structure or alterations in the biomechanical properties of the cornea. Furthermore, Shroff et al.17 demonstrated that the decrease in corneal stiffness assessed by air-puff applanation may not be related to microdistortions after SMILE. Yao et al.10 found significantly more microdistortions in Bowman's layer after SMILE than after femtosecond laser–assisted LASIK, but changes in the cornea's viscoelastic properties were reported less after SMILE than after femtosecond laser–assisted LASIK.5 It is not clear whether more microdistortions were correlated with better biomechanical properties. The long-term effects of microdistortions on the biomechanics of the cornea require further investigation via studies with larger samples. One limitation of the current study is that the sample was small; more participants should be recruited for a more reliable analysis. Another limitation was that the monitoring schedule was not specified; more follow-up time points should be included for assessing the evolution and regression kinetics of Bowman's membrane alterations. We found that some microdistortions in Bowman's layer remained 3 years after SMILE but the microdistortion lengths were decreased. Lenticule thickness has a major influence on the early occurrence of microdistortions, but its effect decreased. The long-term effects of microdistortions on the biomechanics of the cornea require further investigation via studies with larger samples. Patel S, Reinstein DZ, Silverman RH, et al. The shape of Bowman's layer in the human cornea. J Refract Surg. 1998;14:636–640. From the Department of Ophthalmology, Eye and ENT Hospital of Fudan University, NHC Key Laboratory of Myopia, and Laboratory of Myopia, Chinese Academy of Medical Sciences, Shanghai, China (JZ, TH, LZ, HM, DY, XZ); and Aier School of Ophthalmology, Central South University, Changsha, China (YG, QZ). Supported in part by the National Natural Science Foundation of China for Young Scholars (Grant No. 81600762), the National Natural Science Foundation of China (Grant Nos. 81570879 and 81770955), and the Project of Shanghai Science and Technology (Grant Nos. 17140902900 and 17411950200). Drs. Zhao and Gao contributed equally to this work and should be considered as equal first authors.